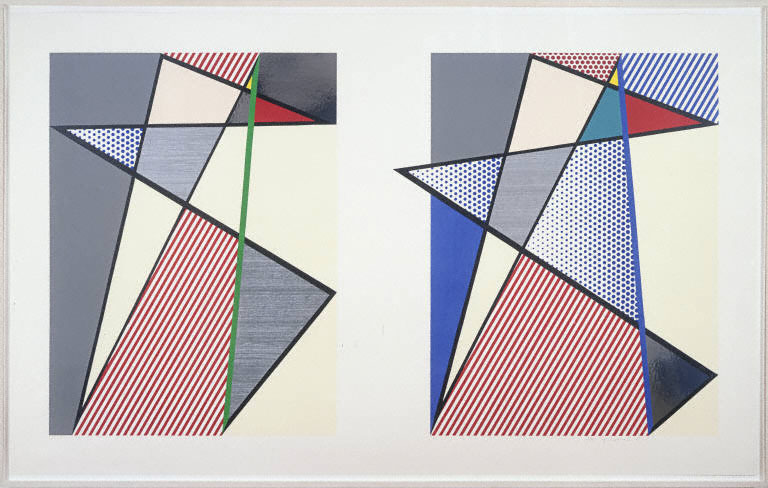 According to Lichtenstein: “In the Imperfect paintings, the line goes out beyond the rectangle of the painting, as though I missed the edge somehow.” Each painting of the series incorporates this protrusion, creating a disruptive element within a geometric design. Keep this concept in mind as you begin your own Lichtenstein inspired piece! Roy Lichtenstein, Imperfect Diptych, 1988. Woodcut, screen print, and collage on museum board. Gift of Sidney Stolz and David Hatfield, 2009. LOOK CLOSELY: What colors do you see? What shapes do you see? What kinds of patterns do you see? Are some lines thicker or thinner than others? How does this change the composition? Do you think the print looks static or dynamic? What makes you say that? 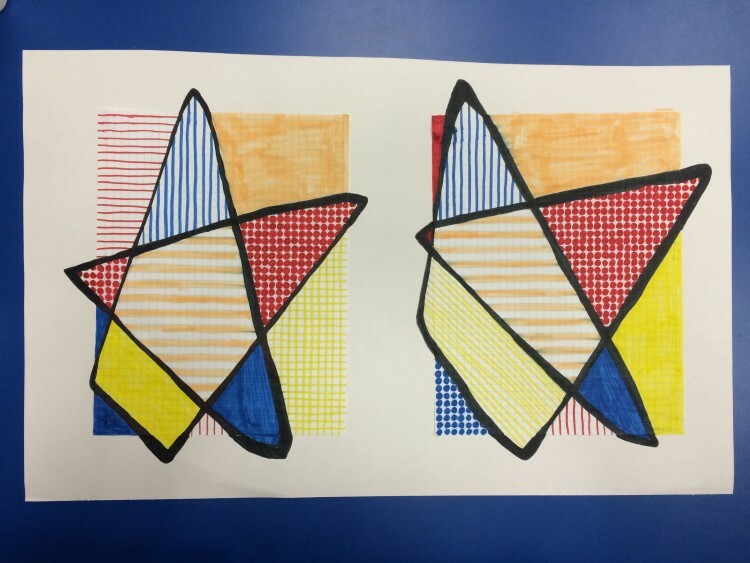 Now, let’s play “I Spy!” Roy Lichtenstein called this print Imperfect Diptych (it is part of the Imperfect Series) because there are slight differences between the two sides of the composition—can you find them? Hint: Look at the colors, shapes, lines and patterns of each side. ABOUT THE ARTIST: In Roy Lichtenstein’s work, popular culture and high art collide. Using cartoon strips, magazines, and commercial advertisements for inspiration, his early artworks combined and enlarged images to create paintings that were both formally and narratively appealing. 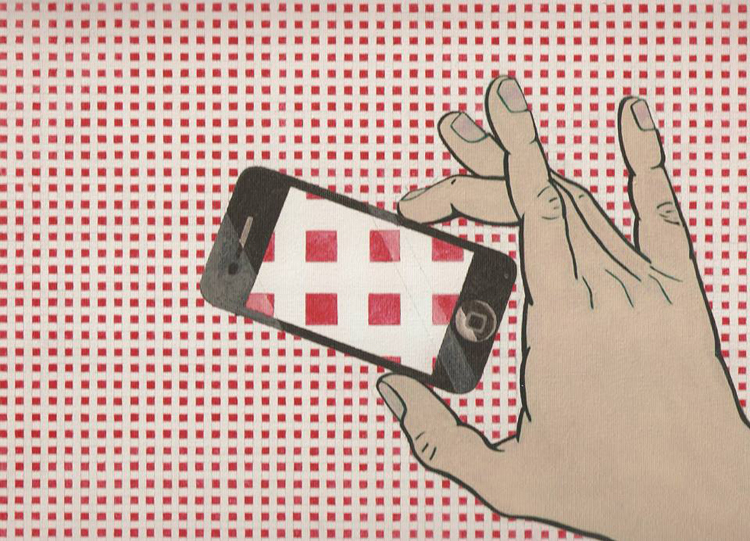 Lichtenstein’s artworks challenge the concepts of originality and reality. His “cartoon” style proposes the question: what is real and what is artificial? Lichtenstein began the Perfect/Imperfect series in 1975 and continued to work in this theme through 1995. Often considered the most abstracted paintings in the artist’s portfolio, this series broke away from Lichtenstein’s former reliance on printed imagery. Instead, Lichtenstein allowed line to take precedence in the Perfect/Imperfect paintings, with thick, black lines dividing the compositions into flat planes of colors and patterns. 1. Tape the back of one piece of graph paper (Graph Paper A) to a flat, solid surface. This will be your art-making surface. Your graph paper can either be horizontal (like a window) or vertical (like a door). 2. 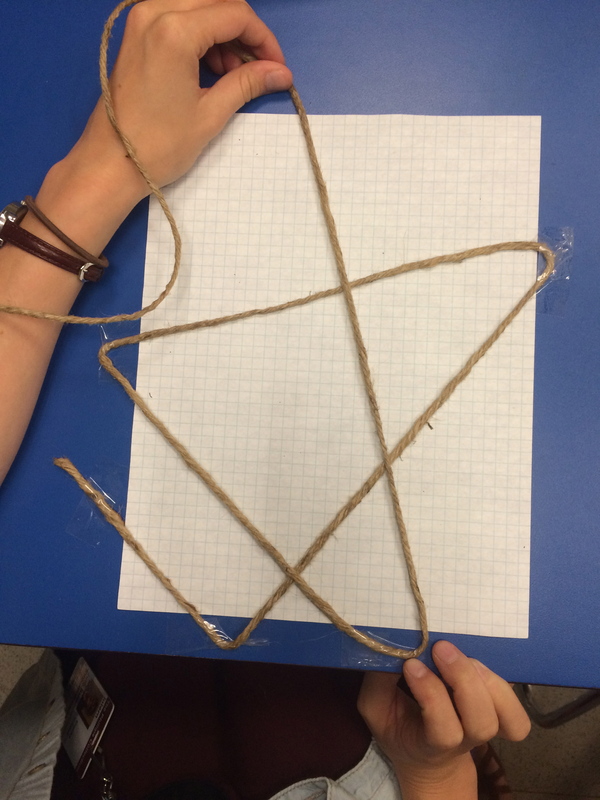 Cut a piece of string the length of your arms—you will need a friend for this step! 3. Tape one end of the string somewhere along the edge of your paper. Tip: Attach the piece of tape to your art-making surface, not your artwork. 4. 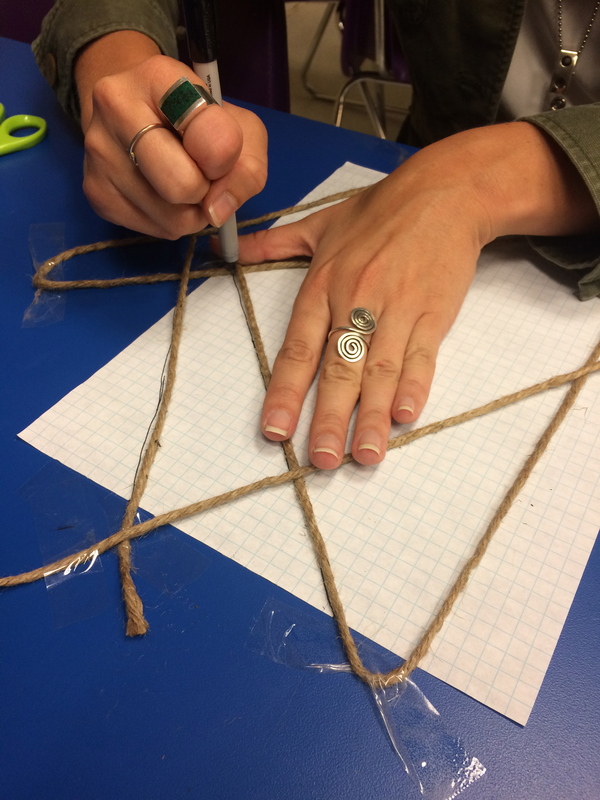 Pull the string taut diagonally across your paper and secure with tape along the edge of the paper. Repeat 5–10 times. Your last diagonal should meet at the same point where you started! How many lines did Lichtenstein use in his artwork? 6. Trace a few lines more than once to make some lines slightly thicker than others. 7. 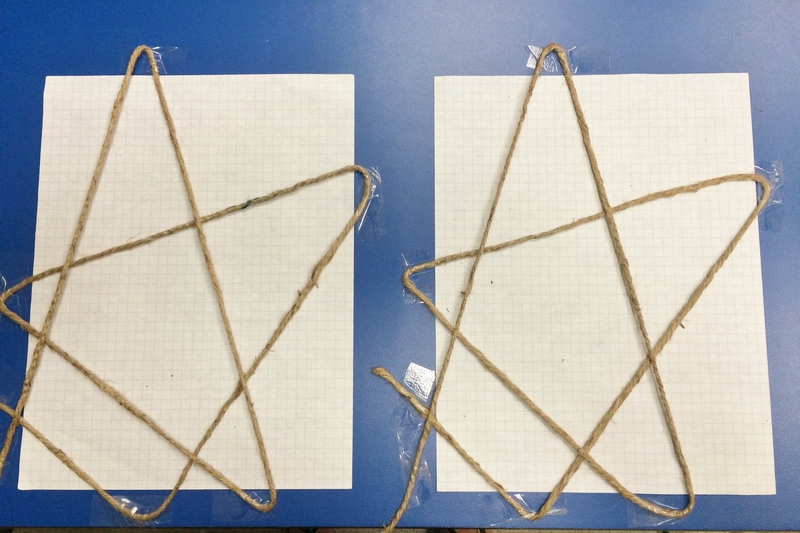 Securely tape your second sheet of graph paper (Graph Paper B) on a flat workspace nearby. 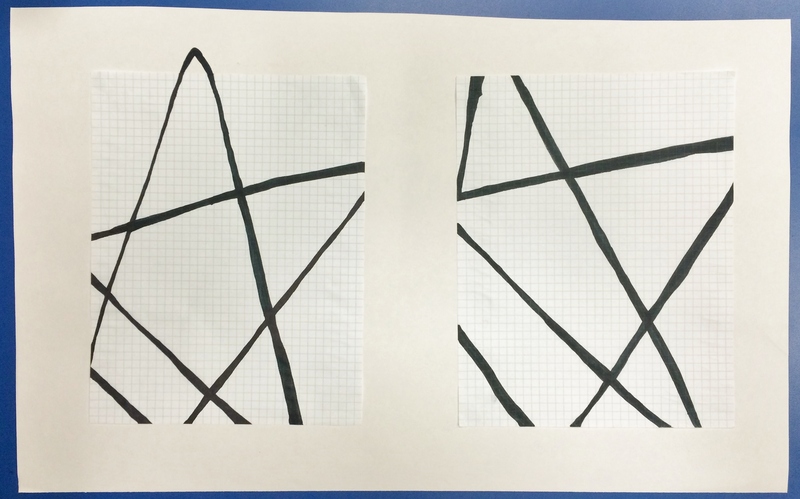 Tip: Use the graph paper to help you create the same diagonals. 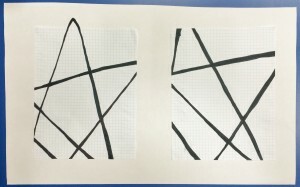 Counting the number of squares between lines will ensure that graph paper A and B are the same. 9. Time to change things up! 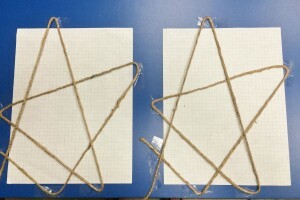 Remove one of the pieces of tape on Graph Paper B and alter its location slightly. You can move it left, right, or further outside the bounds of your paper. Watch how the shapes and lines you have created change as you move this point. 10. Repeat step 9 with at least three of your points on Graph Paper B. One line should extend beyond the bounds of the paper just like in Roy Lichtenstein’s Imperfect artworks. Once you are happy with your alterations, trace the lines with a black sharpie. 11. 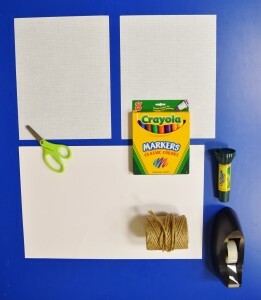 Use a glue stick to attach Graph Paper A and Graph Paper B side by side on a larger piece of paper. Maintain a 1-2’’ border around each piece of paper to create a framing effect. 12. 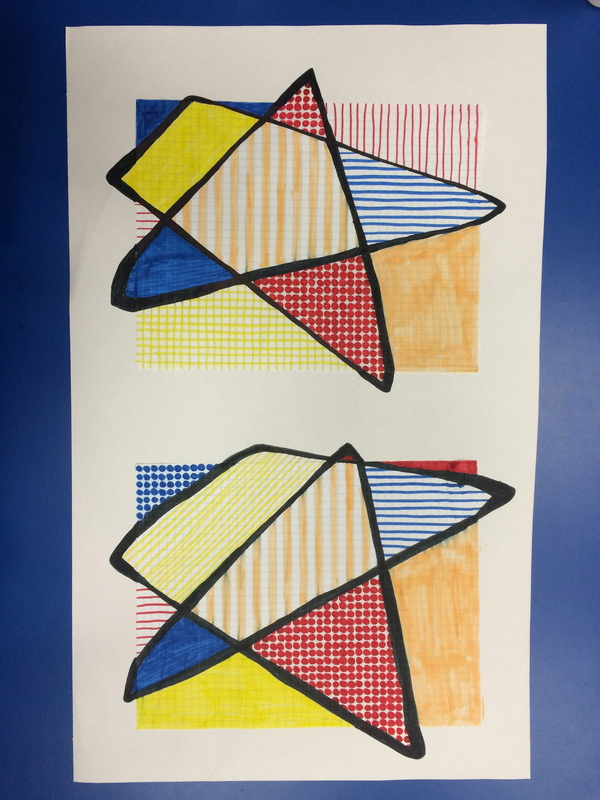 Using a medium of your choice (markers and sharpies are recommended because their colors are more vibrant), fill in the quadrants created by your line on Graph Paper A. Each section can be one color, multiple colors, or a pattern. 13. Now color Graph Paper B. Try to keep some of the sections the same colors and patterns as Graph Paper A, but just like you changed the lines a bit, you can also feel free to change some of the colors and patterns. Have fun and make your artwork your own! When you are finished with you artwork, trade with a friend or family member. How many changes they can identify? Did you make big changes or little changes? Are they hard to find? To me, one of the greatest things about museums is their ability to create interesting juxtapositions that allow viewers to see things they may not have seen otherwise. In a gallery located in the original Phillips house, three striking works are put into conversation with one another: Anni Albers’ Fox I, Roy Lichtenstein’s Imperfect Diptych, and Frank Keller’s Specter Planes VIII. Each composition employs geometric shapes, notably triangles, to very different effects. They provide three distinct visions, demonstrating how similar subject matter can be presented in more than one way. Anni Albers’ Fox I (1972) consists of two horizontal, patterned rectangles, separated by a wide gap. On the top, gray triangles facing in various directions are arranged in front of a red background. The bottom is an inversion of this, placing red triangles over a background of gray. The shapes are uniform in size and evenly spaced. The precision and carefully crafted geometry of this work speaks to Albers’ long career as an accomplished textile designer and weaver. The print is planned and systematic, confined within rigid parameters. Yet, there is a freedom from complete uniformity. Facing in different directions, the triangles add a dynamic element and bring vitality to the work. Measuring 57 7/8 x 97 3/4 inches, Imperfect Diptych (1988) by Roy Lichtenstein occupies an entire gallery wall. Like Albers, Lichtenstein divides the composition into two rectangles. He depicts various geometric shapes, coloring them with matte gray, shiny silver, splashes of red and blue stripes, and of course, red and blue versions of the famous Benday dot pattern. 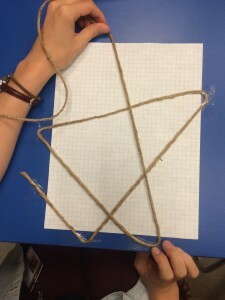 Remember when you were in elementary school and learned how to draw a star without picking your pencil up off of the paper? This print reminds me of that technique in that the shapes seem to all stem from the same line. This composition is not as restricted as the Albers; we can see Lichtenstein starting to experiment with the idea of both preserving the shape’s geometric order, and wanting to break free from it. Frank Keller’s Specter Planes VIII (1980) depicts various shapes that lack a coherent spatial arrangement. No two shapes are identical, though Keller does repeat some muted colors. Because it is a painting rather than a print, the artist’s hand is much more evident in this work than in the others. He employs strong diagonals to create the illusion of space, creating a depth that the Albers and Lichtenstein lack. Of the three artists, Keller breaks free from order the most. Some shapes overlap, obscuring parts of others, and some float away from the center, travelling out past the confines of the composition. Fox I, Imperfect Diptych, and Specter Planes VIII’s current installation in the gallery together not only shows various ways to deal with geometry, but provides a rich viewing experience. From the highly ordered composition by Albers, to the work starting to break free from its confines by Lichtenstein, to the freedom of Keller’s canvas, the order and disorder of each piece is emphasized in its comparison to these gallery companions. We’re still installing artwork for the annual James McLaughlin Memorial Staff Show, but here is a preview. Can you guess which artist in the museum’s collection inspired this work by Elizabeth Temme & m.l.duffy? Elizabeth Temme & m.l.duffy, MAGNApp, 2013. Acrylic and graphite on canvas. It’s Roy Lichtenstein’s work Magnifying Glass!